The Bristol Boarhound was a British army co-operation and liaison aircraft of the 1920s. It was a two-seat biplane with wings of equal span, of steel frame with fabric covering. 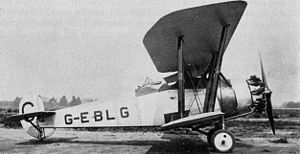 The Boarhound was built as a private venture to Air Ministry Specification 8/24 (later superseded by Specification 20/25) for an Army co-operation aircraft to replace the Bristol F.2, first flying on 8 June 1925 as the Type 93 Boarhound. The Boarhound was a two-bay biplane designed by Captain Frank Barnwell in 1924, using a method of steel construction which involved high-tensile steel strips, rolled into cusped and flanged sections, which were riveted together to form longerons and struts. The resulting structure was lighter, stronger and cheaper than one made from drawn tubes. It had a deep fuselage allowing bulky radio and camera equipment to be carried, and was powered by a Bristol Jupiter IV engine with variable timing. The Boarhound was evaluated alongside the Armstrong Whitworth Atlas, de Havilland Hyena and Vickers Vespa. The Jupiter's variable timing gear gave poorer power at low altitudes, a disadavantage for an army co-operation aircraft, and the Atlas was considered superior. The Directors of Bristol decided, however, to continue development of the aircraft as a private venture for a general-purpose bomber to replace the Airco DH.9A. A second aircraft was therefore built, the Type 93A Beaver, flying on 23 February 1927. This was rejected in favour of the Fairey IIIF, which used the preferred Napier Lion engine, of which large numbers were in store. The Boarhound I (registered G-EBLG) and the Beaver (registered G-EBQF) were withdrawn from use at Filton Aerodrome in April 1927. A further two aircraft were produced as reconnaissance fighters as the 'Type 93B Boarhound II. The two Boarhound IIs were sold to Mexico in 1928, these being used against rebel forces in April 1929. The Boarhounds proved successful in Mexican service, their metal structure proving suitable for the climate. Fighter-reconnaissance aircraft for Mexico, powered by 450 hp (340 kW) Jupiter VI engine. Two built. Donald, David, and Lake, Jon, eds. Encyclopedia of World Military Aircraft. London: AIRtime Publishing, 1996. ISBN 1-880588-24-2.